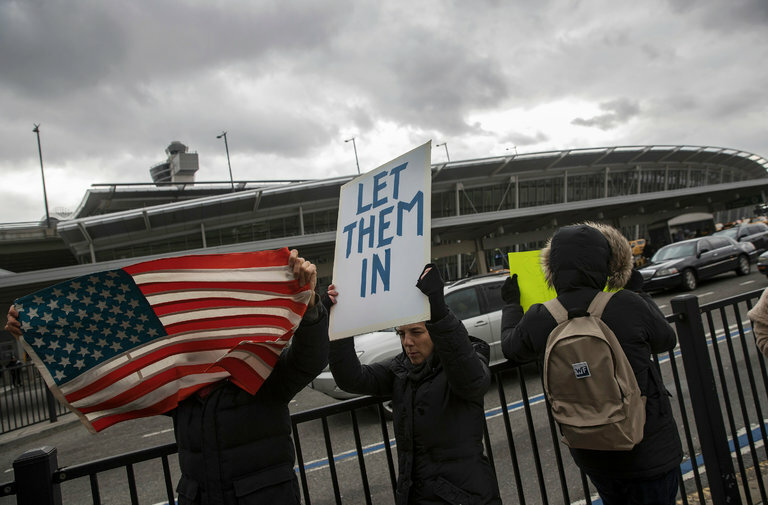 Protesters at JFK International Airport-image from the New York Times. It is widely known that, although Mexican food is delicious, that sometimes foreigners literally can't “take the heat", and the strong flavors and spices can provoke upset stomachs, or “Montezuma´s revenge”, referring to a former Aztec emperor. Thankfully, this year, I have not had any issues with the food, including the delicious, if at times slightly questionable, street food. Or, I hadn't had any issues, before this past Thursday. Although I went to bed feeling fine, I woke up a few hours later profusely sweating, shaking, and realizing that I was going to quickly see my meals a second time round. And I did see them, several times throughout the night, until my stomach was finally empty. Thankfully, I was finally able to sleep, and woke up a few hours later feeling mostly fine. My host dads had both happened to be out of town that night, and were very concerned when I informed them of my stomach bug, insisting that I stay at my pastor´s house for the weekend while they had to work. Although I come from a cultural context that encourages minimizing and shrugging off illness (I'm fine, I'm fine! ), not to mention the exorbitant cost of health care for so many people in the States, I decided to take them up on the offer. I arrived at my pastor´s house to be welcomed by the warm arms of Toña, our pastor´s wife, and my unofficial Mexican mami. I went straight to bed, and woke up to find that she had prepared rice, Jello, and had brought juices for me while my stomach recovered. I spent the weekend with her, her kids, and my fellow YAGM volunteer Justin hanging out, shooting the breeze, watching Netflix, and helping get ready for church that Sunday. That weekend of rest and being in community not only helped my stomach recuperate, it warmed my soul. At first glance, this story is a fairly normal, ordinary experience-people get stomach bugs all the time. For me, however, it is an example of what YAGM staff had urged us to look for in our years-the holiness in the everyday moments, God manifest in the mundane. For me, this story is representative of the community that has welcomed me here-the concern of my host dads, my pastor´s wife who took care of me, my pastor who called from a conference in Chicago to see how I was doing, and my coworkers and congregation members from my church who checked up on me. For me, it is nothing short of miraculous that only after a few short months, I have a community that has washed me with love, that has accompanied me every step of the way. The idea of accompaniment is core to the YAGM philosophy and a vein that runs throughout all aspects of life in México. “Te acompaño” or “I accompany you” is a common phrase, that both means literal physical accompaniment of someone to the store, market, etc.., but also an emotional accompaniment. It is knowing that you don't have to go it alone, that we are inherently communal, social creatures. The idea of “Yo no soy si tu no eres”: ”I am not me if you are not you”-that we are all inherently dependent on each other. It is an idea that runs very contrary to US culture, a culture that values independence, self-reliance, and individualism-think the image of the lone ranger, the cowboy riding off into the distance, “pulling yourself up by your bootstraps”, etc...At first, this idea was jarring to my US-based, preconceived idea of what it means to be someone coming into their young adulthood. However, this year has been a lot of self-critique and pride-swallowing, of being dependent on others for emotional, physical, and linguistic support, of admitting to myself that is ok to let my guard down, to be honest when things aren't fine, of being more willing to receive help. “The alien who resides with you shall be to you as the citizen among you; you shall love the alien as yourself, for you were aliens in the land of Egypt” (Leviticus 19:34). “You shall not deprive a resident alien or an orphan of justice” (Deuteronomy 24:17). In wake of the recent immigration/refugee ban, I have seen these and similar verses being shared frequently on social media. These verses have newfound meaning for me this year, particularly the one from Leviticus. This year, I am the alien in the strange land-the alien that looks different, has a funny accent, makes a lot of grammatical errors, does not fully understand local customs, and sometimes has no clue what´s going on. However, unlike so many of those who will be affected by this new ban, I have all the privileges of being a white, upper middle-class, straight, college-educated US citizen. As my fellow YAGM volunteers and I prepare for our upcoming retreat to the US-Mexican border, the power of my blue passport is not lost on me as I think of all those who were recently turned away from airports both in the US and abroad, while I will be able to enter that airport and cross that border with ease. My heart breaks reading stories of those who had worked for years, and upon receiving the visa, sold everything, left their jobs and communities, pulled their kids out of school, and spent thousands of dollars on flights, only to be turned away upon arrival. For the ones who endured hours of uncertainty in airports while waiting to reunite with their loved ones, while I know that come July, I will be able to reunite with my family with ease. For those who will not be able to save their families from brutal warfare and bloodshed, such as that which was seen in Aleppo just this past December. For our Muslim brothers and sisters in the US who fear future Islamophobic retaliation. This ban goes against the values we hold as a country-of welcoming “...your tired, your poor, your huddled masses yearning to breathe free...¨, of diversity as our strength, of giving refuge to those who need it. As children of God, we are called to accompany and to stand in solidarity with the most vulnerable, the most oppressed of our society: “the preferential option for the poor”, as it´s known in liberation theology. Just as my community accompanied me so beautifully during my stomach bug, we are called to accompany those who are fleeing some of the most brutal conditions on earth, those for whom this ban is truly a matter of life and death. As a church, we must denounce this ban which goes so clearly against what Jesus calls us to do. As Bishop Eaton wrote in her statement on the ban, "In Matthew 25:35, Jesus said, "I was a stranger and you welcomed me". Our Lord not only commanded us to welcome the stranger, Jesus made it clear that when we welcome the stranger into our homes and our hearts-we welcome him". As a stranger in a strange land who has been the recipient of radical hospitality, I pray that our country takes swift and decisive action against this ban, and does not abstain from showing welcome to those who need it most. Interested in ways to take action? If you are financially able, consider donating to one of many excellent organizations that support refugees, such as the ACLU, Lutheran Disaster Response, or many others such as the ones listed here and here. Contact your representatives, and contact them frequently-calling is much more effective than email, online petitions, or facebook statuses/tweets. Check out the website 5 Calls, which provides scripts and contact information to help you take 5 minutes to make 5 calls to your representatives. (And check out their many sources to see why calling is one of the most effective ways to get your voice heard).